Amazon is back to its big spending, big revenue, money losing ways. The online retail giant reported a loss Thursday for the first three months of the year, after briefly jumping into the black during the holiday shopping season. Yet sales soared from year-ago results, trumping Wall Street's forecasts. None of that was particularly surprising. The big news was that for the first time ever, Amazon shed some light on its cloud business. Amazon (AMZN) for years has been selling excess capacity from its massive server farms to power many of the world's websites, apps and services. But like most products other than Amazon's retail business, the company has kept its Amazon Web Services cloud business shrouded in the mystery of the "other" field in its revenue statement. No longer. Amazon said that last quarter, the cloud business earned $265 million in profit on $1.5 billion in sales, putting it on pace to bring in $5 billion in revenue this year. Sales were up a whopping 49% from a year earlier. "Amazon Web Services is a $5 billion business and still growing fast -- in fact it's accelerating," said Jeff Bezos, Amazon's CEO, in a prepared statement. 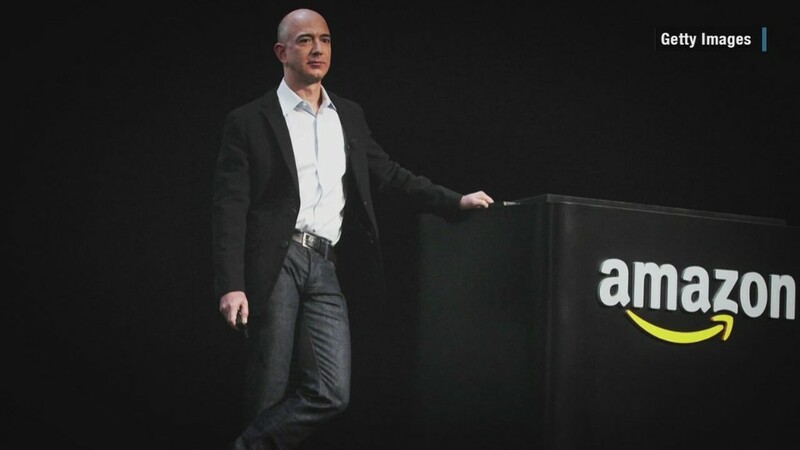 "Born a decade ago, AWS is a good example of how we approach ideas and risk-taking at Amazon." On a conference call with analysts, Amazon noted that customers have largely stuck with AWS despite growing competition from Microsoft (MSFT), IBM (IBM) and Google (GOOGL). Though rivals' products are gaining customers, Amazon said its prices remain the best in the industry, and its years-long headstart in the cloud gave it an opportunity to create a number of cloud products to suit any business. Amazon is remaining secretive, however, about its other products, including Prime, Instant Video, Kindle and other businesses. Amazon said those investments are paying off. For instance, people who stream video on Amazon tend to also buy other items on the site. Overall, Amazon reported a net loss of $57 million, or 12 cents per share, in line with the estimates of analysts polled by Thomson Reuters. A year earlier, Amazon reported a $108 million profit. Sales for the Seattle-based company rose 15% to $22.7 billion, topping analysts' forecasts of $22.4 billion. Shares of Amazon rose 2.5% after hours.